When it comes to elections, my faith in GOP Chairman Charlie Webster is limited. Looks like some Republicans might agree. Last year, he and Secretary of State Charlie Summers did their very best to reshape Maine elections by eliminating the 38-year-old practice of same-day voter registration. I worked on the People’s Veto effort to overturn that law, which means I’m hardly an unbiased source when it comes to the two Charlies. I thought what they did was wrong, and I said so often. Maine voters agreed, overwhelmingly rejecting the elimination of same-day voter registration. During the campaign, Webster and Summers made a big show out of made-up charges of voter fraud. They held press conferences, sent threatening letters to students, created sketchy reports, all with the intent of convincing people that nasty liberals were stealing Maine elections. Voters saw through the deception. Now, Webster finds himself in a new stew of allegations about electoral malpractice. But this time, the charges are aimed at him. And they’re being fired not by Democrats or other boogeymen of the left, but by fellow Republicans. Last weekend, Maine held its Republican caucus — sort of. Former Massachusetts Gov. Mitt Romney was announced the winner of the GOP preference poll, with 39 percent of the vote. 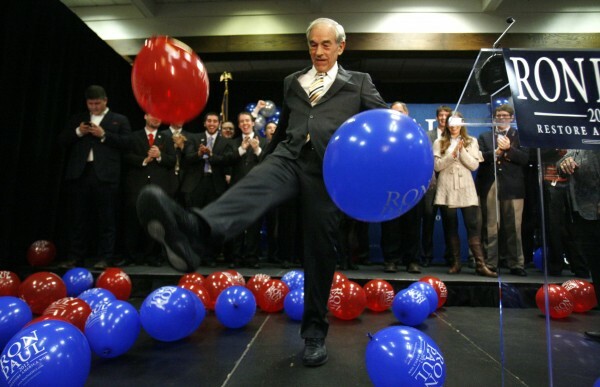 U.S. Rep. Ron Paul was second, with 36 percent of the vote. Of the roughly 5,500 votes cast and counted, Romney won by an Election Night tally of 194 votes. Most of the Republican caucuses reported their results, which were announced as final on Saturday night by Webster. But Washington County did not. Its caucus had been postponed by the threat of bad weather. A number of other towns, for one reason or another, also didn’t report in time for Saturday night’s tally, and a few, including Belfast, have claimed that the results listed by the party are incorrect. It’s all enough to give Paul, and his supporters, room to argue that Romney, desperate for a win, conspired with the Republican establishment to steal the caucus. Of all the candidates in the Republican primary, Paul’s supporters are the most likely to be drawn into conspiracy theories and to view establishment Republicans wearily. And they don’t have to look too far back to find claims of caucus calamities to support their case. In March 2011, a special election was held for a Maine House seat representing parts of Penobscot, Hancock and Washington counties. There was a controversy involving Webster, Summers and Assistant Majority Leader Andre Cushing. All three were in Lee on the day of caucus, which was called to select the Republican candidate for the open seat. Arcane party rules meant that most of the Republican voters in Lee couldn’t help select their candidate. According to Webster at the time, a number of other towns, including Princeton, also couldn’t participate. The presence of Republican rainmakers at the disputed caucus lead one candidate to claim the selection process was rigged. Beth Turner went on to win the nomination and the special election, joining the Maine House of Representatives. Republican Phillip Merletti felt he had been cheated. Merletti is a self-described constitutionalist and tea party Republican. Webster called him a fringe candidate. “He ran, and he lost. He doesn’t like that he lost,” Webster said. At the time, I was inclined to agree with Webster. But if you switched the names and the dates, the story from March carries the undercurrent of what happened on Saturday. And again, eastern Maine and Washington County are at the heart of the dispute. Paul is well-organized and his supporters aren’t giving up on Maine just yet. Regardless of how the caucus tally is eventually sorted out, no delegates were awarded. Paul still has a chance to make his case and out organize his opponents. The Maine GOP caucus is little more than a straw poll for presidential preference. Delegates to the GOP National Convention will be awarded as part of the Republican State Convention, which will be held May 5-6. That’s when the real fight between Paul and Romney will start. David Farmer is a political and media consultant. He was formerly deputy chief of staff and communications director for Gov. John E. Baldacci and a longtime journalist. His clients include Maine Equal Justice Partners and EngageMaine. You can reach him at dfarmer14@hotmail.com. Follow him on Twitter @dfarmer14.